Outlook is a popular personal information manager (PIM) product of Microsoft while Gmail and its Contacts is a popular web based service provided by Google. So it’s understandably that both products won’t be compatible with each other by default. However, it seems that there is no effort been done by either Microsoft or Google to make migration or syncing between Outlook and Google Gmail Contacts easier. There are several third-party effort to develop a tool to sync contacts between Gmail and Outlook, most notably is GO Contact Sync. The GO Contact Sync allows automatic synchronization of contacts between Gmail and Outlook without the need to manual import and export via CSV or vCard file. However, the development of GO Contact Sync appears to have stopped, and thus a group of developers have decided to branch out a fork from GO Contact Sync to continue fix bugs, enhance, refine and update the utility, as GO Contact Sync Mod. GO Contact Sync Mod is a standalone program that performs automatic true sync between Outlook contacts with Google Mail (Gmail) address book, with synchronization also supports contact pictures, categories (groups), and notes. GO Contact Sync Mod also supports auto start up with Windows boot up, and automatic synchronization. Synchronize your contacts between Microsoft Outlook and Google (Gmail) Contacts. Contact categories and contact photos. Backup Outlook contacts to the cloud. Synchronize Exchange contacts as well as contacts in a PST file. Synchronize Outlook contacts with Windows Phone 7 (WP7), iPhone and Android over the air through Google. Download GO Contact Sync Mod from http://sourceforge.net/projects/googlesyncmod/files. GO Contact Sync Mod supports Outlook 2010, 2007 and 2003, but only for 32-bit (x86) version. 64-bit Outlook 2010 users best alternative is probably to downgrade to 32-bit Office Outlook 2010. Install and run GO Contact Sync Mod. Enter Google Account user name and password credentials. 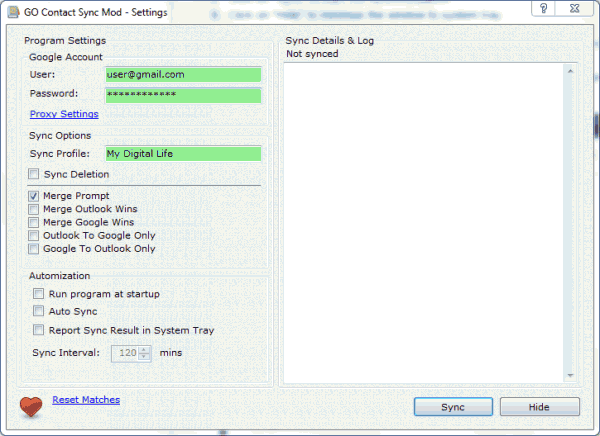 Enter a name for Sync Profile (not Outlook Profile name) which must be unique for different computer and account to sync with Google Contacts account. By default, GO Contact Sync Mod does not sync deletions. If you want to synchronize deletions, check the option “Sync Delete”. Select one of the synchronization method from Merge Prompt (ask on conflict), Merge Outlook Wins (overwrite Google Contacts on conflict), Merge Google Wins (overwrite Outlook contact on conflict), Outlook To Google Only (sync contacts one way from Outlook to Google), Google To Outlook Only (sync contacts one way from Google to Outlook). Click on Sync to start syncing. There are several options available which can be configured if desired, such as “”Run program at startup”, “Auto Sync” (sync interval can be set when enabled), “Report Sync Results”. GO Contacts Sync can be hidden to system tray (notification area) by clicking on “Hide” button. User can right click on the tray icon to manually start the sync too. Last but not least, a “Reset Matches” button is available to reset all sync states so that sync will start from scratch, just in case there is accidental deletion or error when sync.